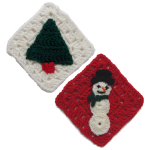 Christmas Tree Countdown -- $1.99 A Crochet pattern from Julie A Bolduc. This crocheted Christmas Tree Countdown is made from the bottom up and is supported by dowels on the back side. The tree stand is made after the main part of the tree is stitched. Each ornament is made one at a time and attached to the tree with a bead at the top. Each ornament is has a miniature flat back ornament glued to the front and the back has a circle cut from a recycled Christmas card. Then the cut edges of each circle is covered with a decorative metallic red and gold braid trim. 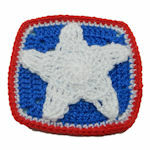 To use this count down, just turn an ornament over each day saving the star for last. If you have left over supplies, you can use them to make more ornaments for your familys Christmas tree! They would also make great little gifts!